Children's Picture Book Database at Miami University | Oh, no! Where are my pants? Oh, no! Where are my pants? Fourteen poems about everyday life tell about friends moving away, forgetting your pants and the death of a class pet. Other poems include Winter Rabbit, Play Ball, Nightmare, and My Friend Is Gone. Hopkins, Lee Bennett, “Oh, no! 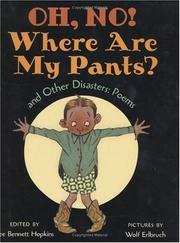 Where are my pants?,” Children's Picture Book Database at Miami University, accessed April 19, 2019, https://dlp.lib.miamioh.edu/picturebook/items/show/13866.